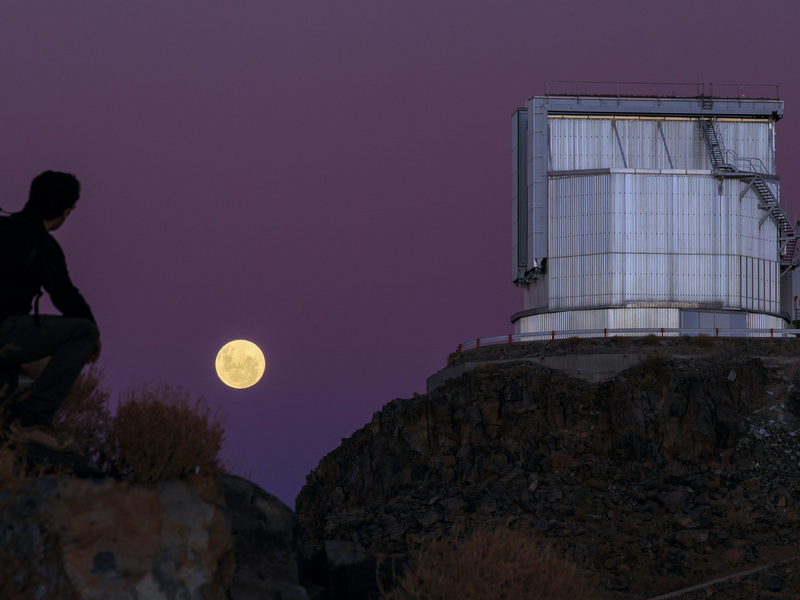 This picture, taken at the La Silla Observatory in Chile, shows the full Moon low in the purple sky, a photographer crouching on the rocks, and the New Technology Telescope (NTT) perched on a hilltop. 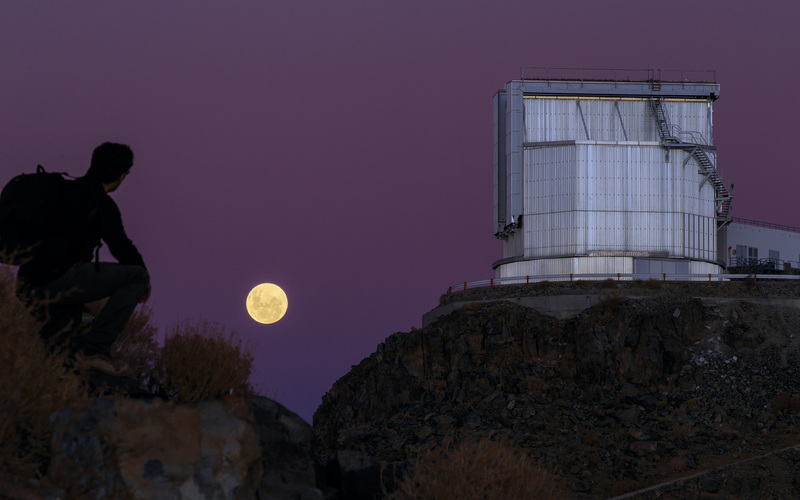 This image depicts the three things we need for observational astronomy: An object to observe, a telescope to observe it, and a person to make sense of the observations. The Moon is the closest celestial body to Earth and orbits at a distance of 400 000 kilometres as our only natural satellite. Despite the aesthetic glow of the full Moon in this image, the Moon is not a great friend to astronomers. Sunlight that reflects off the lunar surface causes light pollution and makes it harder to observe more distant and very faint objects. Light pollution does not, however, bother the man admiring the view here. This is Babak A. Tafreshi, one of ESO's Photo Ambassadors. The gap between astronomers and extraterrestrial bodies is bridged by the telescope. 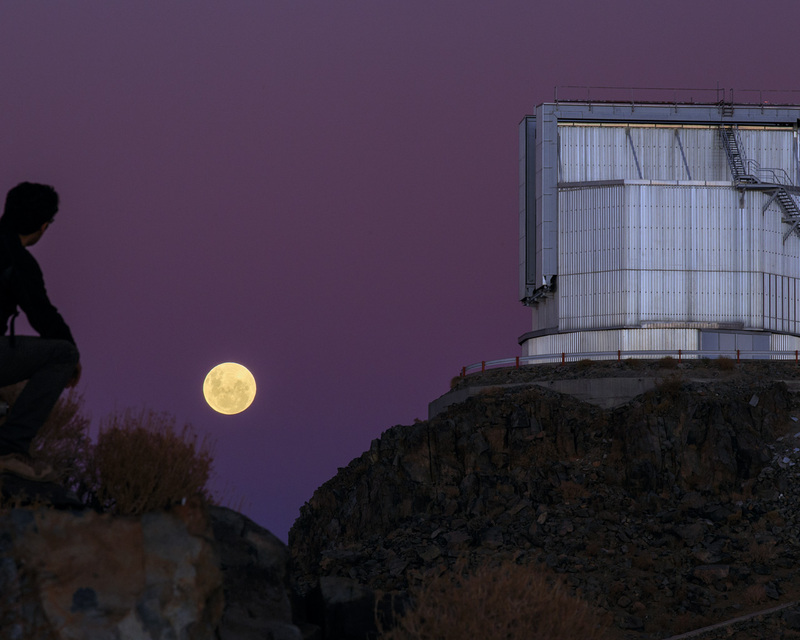 In this picture we can see ESO's NTT, a telescope first installed in 1989 and completely upgraded in 1997 in the "NTT-Big Bang". A key feature of the NTT is that it pioneered the use of active optics to adjust the thin telescope mirror so that it is always the optimum shape to form the sharpest images.